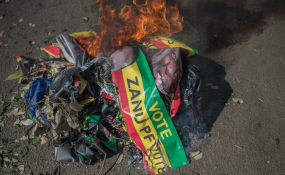 Protesters in Harare burnt ZANU-PF posters. ZANU PF youths have vowed to resist any move to increase the presidential age limit for contestants from the current 40, describing the proposal as "selfish, evil" and potentially self-defeating. "We will be engaging the leadership on the alleged proposal to raise the presidential age," said Zanu PF youth league political commissar Godfrey Tsenengamu in an interview. "Why punish innocent generations, its alien to Zanu PF and it won't see the light of the day." Constitutionally, anyone aged 40 and above can run for president but some ruling party officials have called for the limit to be raised. Senior party officials such as Joseph Chinotimba and Lovemore Matuke have already indicated that the ruling party might use its parliamentary majority to force the necessary constitutional amendment. Zanu PF secured a two thirds majority in the house of assembly in the bitterly disputed July 30 elections. The age limit adjustment is aimed at opposition 40 years old MDC Alliance leader Nelson Chamisa who has rejected the election results and maintains he won the elections. Zanu PF officials the intransigency on immaturity. "We are seriously considering to use our parliamentary majority to effect a constitutional amendment raising the age limit for election to the Office of the President because we are now worried about what immature people like Chamisa are doing," said Matuke. "They are holding the country to ransom, and we feel it is to some extent because of immaturity and childishness. "When a person goes for an election, they must be prepared for all the outcomes - win, lose or a stalemate. "It is a sign of immaturity for a person to expect only to win in an election and as a result we feel there is need to have a serious relook at the presidential age limit." Tsenengamu was however emphatic that ruling party youths would oppose the amendment. "We will resist such efforts to amend the constitution; such a move is selfish to an innocent generation," he said. "As youth we voted President Emmerson Mnangagwa despite the fact that he is way above 40. We did not vote for age but for a progressive leader." He added; "We will still vote for him (Mnangagwa) in 2023, so why waste time on an amendment which is not necessary? "Imagine a situation, even in the very distant future, when there will be a popular candidate below the proposed age limit, and maybe within the party, then not having the two thirds majority in parliament to bring back the 40 years." Ruling party youth wing said they will block a 'selfish' and 'evil plot' by some leaders in Zanu PF who intend to move a motion in Parliament to raise age limit for contesting candidates for the presidential seat. Currently anyone above 40 years can contest with the Zanu PF youth arguing that one day it will work against them. Leaders such as Joseph Chinotimba and Lovemore Matuke said Zanu PF may be forced to consider using its majority in the National Assembly to effect a constitutional amendment raising the presidential age limit to ensure that only mature people contest for the utmost office. This is so according to the two that losing presidential candidate like the MDC Alliance Nelson Chamisa's behaviour before, during and after the elections. But the ruling party youth wing national political commissar Godfrey Tsenengamu said they will resist such an ill-conceived move. "We will resist such efforts to amend the constitution, such a move is selfish to an innocent generation," said Tsenengamu in an interview. "We will be engaging the leadership on the alleged proposal to raise the presidential age, why punish innocent generations, its alien to Zanu PF and it won't see the light of the day." "As youth we voted President Mnangagwa despite the fact that he is way above 40." He added, "We didn't vote for age but for a progressive leader, we will still vote for him in 2023, so why waste time on an amendment which is not necessary." "Imagine a situation even in the very distance future where they will be a popular candidate below the proposed age limit and maybe within the party then not having the two thirds majority in parliament to bring back the 40 years."